As the year rolls to an end, finding room for all of our new gadgets, clothing, and stuff from the holiday season can be difficult. Want to make the most of out of your space? Check out these amazing closet organization tips using the latest and trendiest closet systems this year. No matter how much or little space you have, a customized closet organizer is the most popular option for maximizing space and minimizing clutter in your home. One of the top closet organization tips is making the most of your closet by designing around your current space and furniture with a professional. Whether you have a small studio apartment or a luxurious mansion, an interior designer can help you see where you can store your belongings in a stylish and efficient manner. Save money by using unused spaces. Open up room in your home by storing away rarely used items. A professional will help you accomplish this and more affordably. While less attractive than a customized closet space, many homeowners still opt for traditional hanging solutions. These usually require a little do-it-yourself savvy and include a combination of rails, rods, and various add-ons. This is especially ideal if you want a more functional and not necessarily aesthetically pleasing, space. Why be satisfied simply with a closet space? 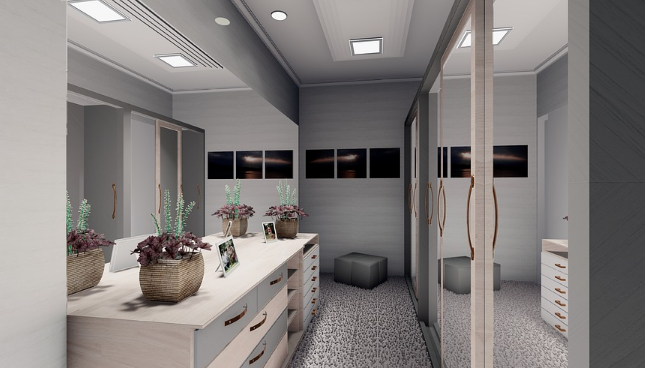 Why not design a walk-in closet? Create a luxurious space in your home where you can choose your wardrobe, dress, and enjoy taking care of you. Included with this amazing organization solution are options like attractive custom lighting, beautiful wood finishes, an impressive array of custom drawers, and almost limitless layout choices. Store everything from evening dresses to winter boots to jewelry. Whether you opt for a customized closet space, a walk-in closet, or decide to go DIY, be sure to include attractive lighting in your design. Lighting can make the difference between a space feeling like a private haven to a monstrous nightmare. Choose options like glass shelving and attractive wood finishes to make your closet space even more attractive and functional for years to come.